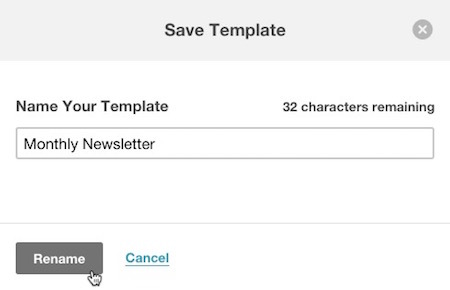 Any of your saved templates can be replicated from the Templates page in your account. This can save you a lot of time when you need to use a previous layout so you don't have to completely recreate it or when you want to test a new layout. Click the template's drop-down menu and choose Replicate to open the copied template in the template editor. Enter a name for the new copy of your template, then click the Rename button on the Save Template pop-up modal. After renaming the template, choose to Continue Editing or Exit To Templates. 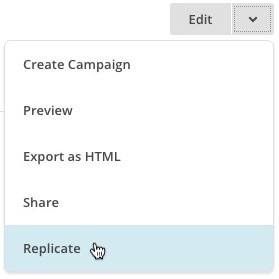 Replicate a campaign to create an exact copy to use as the starting point for a new campaign.